Start a successful business while you're still working in a job? Believe in yourself enough to walk away from that job? Build your side business into a freedom-based lifestyle so you can be, do, and have all that you were meant to? 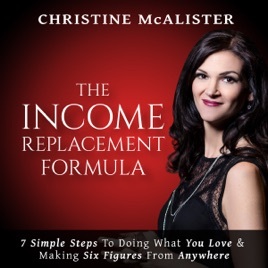 In The Income Replacement Formula, author Christine McAlister shares the simple seven-step formula that helped her overcome her own personal tragedy and then realize her dreams of discovering and building a business around her unique gifts. This is the same formula she uses with her high-level clients every day to help them live their own dreams of freedom and fulfillment. If you're a high-achiever who has been thinking about quitting your job or starting a business since what feels like forever, or you already have a business that's just not working the way you wish it would...this is your audiobook.